The third in our summer race series, the Oke Croak, took place last Saturday on a beautiful sunny day slotted between two wet and windy ones. The sun always seems to shine for this race giving it a reputation of a very tough but stunningly beautiful run. Starting in Simmons Park, the runners are taken along Ball Hill to Fatherford, continuing on through the woods to access the moors at Chapel Ford. From here the course is no longer marked and the race becomes self-navigating out to a checkpoint at Oke Tor, after which varying routes will be taken either round or over East Mill Tor to then climb to the top of Yes Tor where there is the only other compulsory checkpoint. Once the boulders around the summit of Yes Tor are cleared, the almost entirely downhill course gives the runners he opportunity to finally get some speed up if the legs aren’t too tired. Leaving the moors at Moorgate, the return route is via Klondyke corner to Fatherford and they then retrace the path back to the park along Ball Hill. The conditions were perfect for a great race and the first two runners both finished inside the previous course record, with the winner, Ceri Rees, knocking three minutes off with his brilliant time of 1.15.19. A good battle can always be assured between Rob Hicks and Axe Valley runner Tim Lenton, but while these two were having a tussle coming along the road from Moorgate, Paul Crease flew past both of them and continued to put distance between them, running sub-six minute miles to come home in third place in 1.21.12. The first ORC lady home was Charlie Collyer with a great time of 1.56.30 to be second lady overall with Gill Spinney taking the third lady prize in 1.59.03, a thirty minute improvement on her time last year. Before taking up her marshalling duties at the Oke Croak, prolific race runner Jo Page ran a new PB at the Killerton Parkrun which is not normally regarded as a PB course. Jo has taken a step back from racing at the moment while training for her first marathon, but ran here to accompany her father and was very surprised and pleased to set her new record time of 21.01. Sunday saw two ORCs, Roger Voaden and Geoff Hill, take part in the Plym Trail Marathon. For Roger this was just another marathon to tick off in his quest to complete 100 marathons, this being his 88th while Geoff used it as training for his upcoming Lochness marathon. On a day where the wind and rain were exactly the conditions they didn’t want they both did remarkably well. After running together for the first 20 miles Roger pulled away from Geoff finishing in 3.26.30 for second place, with Geoff coming home in 3.37.25 to be third. With summer holidays occupying many ORCs, there were just a handful of out racing this weekend. On Saturday evening Mike Westland took part in the inaugural running of the Wessex 10k in Somerton, Somerset, the ancient capital of Wessex. Starting and finishing at Somerton Recreation Ground the course follows a fairly flat, mainly road route and was a well organised but low key race hosted by Immortal Sport. Mike ran well, finishing in 52.03 to be first in the MV60 age group. 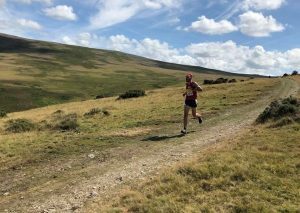 Further away, Paul Crease flew the flag for Okehampton when he ran the Weasdale Horseshoe Fell race in the Eden district of Cumbria, where the 10.5 mile course had an elevation of over 2,100ft. In the company of good fell runners, including the current British Fell Running champion, and over a course where local knowledge was an advantage, Paul had an excellent run to finish in fourth place overall and first MV40 in a time of 1.26.50. On Sunday Ed Dumpleton travelled up to Bath for the Bath Two Tunnels Half Marathon. This quirky course has a mix of scenic countryside, some city centre running through the heart of Bath along footpaths and trails, and as the name implies, two tunnels to negotiate. The tunnels formed part of the Somerset and Dorset railway which closed in 1966 when the tunnels were sealed up. In 2013 they were restored and are now well surfaced and lit, forming a shared path for cyclists and pedestrians. At 1,672m long, the Combe Down Tunnel makes this the foot-race with the longest underground section in Britain. Ed is at present in the middle of training for his first marathon and used this race as part of that training. With some hold-ups caused by other users of the paths it was never going to be a PB run, but Ed was happy with his time of 1.40.27. 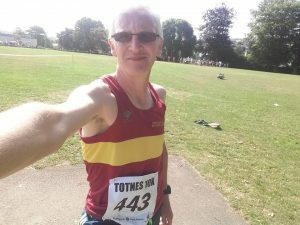 For Hayden Bond, Torbay was the destination to run the Torbay 5 Bays Challenge, a 10k race organised by Torbay Athletics Club. This is a multi-terrain race that starts and finishes at the lovely Broadsands beach, following an inland route to Brixham from where it heads back along the coast path via Oxen Cove, Fishcombe Beach, Churston Cove and Elberry Cove. With stony tracks, shingle, steep climbs and a total of 423 steps either up or down this is quite a tough 10k. Hayden finished in a very good time of 48.46 in 16th place overall. The hot weather finally had to break and it did so this weekend, making running somewhat more comfortable in the more usual damp and drizzly conditions of an English summer. This was particularly good news for the ORCs taking part in the Roseland August Trail, a tough endurance race along the coast path of south Cornwall and known as the RAT. There are four distances here, all denoted by different colour routes, setting off at different times and start places, the shortest being the White RAT which is 11 miles, then the Red RAT at 20miles, the Black Rat which is an Ultra Marathon of 32 miles and finally the Plague. This is not only a physically challenging 64miles, but is a huge test of mental strength as the runners set off from the finish at Higher Porthpean at five-past midnight, run 32 miles out to where the Black route starts at St Anthony’s head near Falmouth and then turn and run back again. Even those who take on the tough Black Rat are in awe of those who can do it twice, the Plaguers eventually clocking over 15,000ft of ascent. Rob Hicks isn’t daunted by this challenge though, this being the third time he’s completed it, and he finished in an excellent time of 13hr 03min 37sec, very close to his time last year when he was third, but this year coming sixth. Jo Turner was running the Black Rat for the second time, her previous run being in 2015 when this was her first taste of Ultra running. Since then she has completed several ultra marathons and the experience and strength she has gained from these showed when she produced a brilliant run to finish in 7.50.23, an hour’s improvement on before. The rather ill prepared duo of Heidi Wills and Charlie Galley ran the shortest route, the White Rat. Wearing road shoes and having not trained much recently they found it hard going on paths made slippery by the rain on bare earth, but still enjoyed it, finishing in 2.30.43. Away from the coast the cooler conditions weren’t unwelcome either, but a strong breeze was not so popular with the runners of the Sticklepath Horseshoe race on Dartmoor. 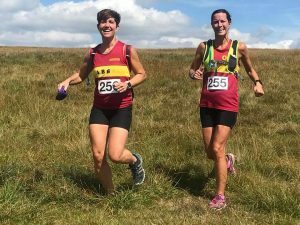 This is a lovely fell race, starting in Sticklepath behind Finch Foundry and taking the runners up to Belstone initially via a wooded track, then Belstone Cleave and Belstone Common, where the moors themselves greet them with a steep ascent of Belstone Tor. This is followed largely by a ridge route run round the Horseshoe, broken by a steep descent into Steeperton Gorge and an even harder climb up the other side onto Steeperton Tor. After crossing a ford there is a long slog up to the top of Cosdon Beacon followed by a fast descent off the other side, to then retrace the track back to Sticklepath. There was a stiff headwind on the outward part of the course but the runners enjoyed the benefit of a tailwind helping to push them up Cosdon on the way back. 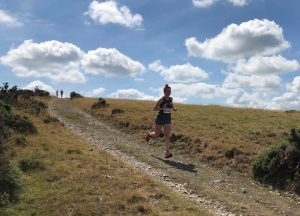 First home for the club was Mike Baker, a keen moor runner who finished in 1.38.51 while the first Okehampton lady was Charlie Collier whose time of 1.55.14 secured her the second lady prize. Other ORC times; Mervyn Rice; 1.47.44, John Binns; 1.49.58, Andy Collier; 1.55.13, Gill Spinney; 1.57.01, Christine Fritsch; 1.59.00, Robert Richards; 2.28.36, Deborah Cunningham; 2.30.18, Anne Binns; 2.40.42, Janet White; 2.40.43. Last Tuesday five ORCs had a good evening at the Exe 5K Summer Series race, where breezy conditions didn’t stop them from bringing home some good PBs. 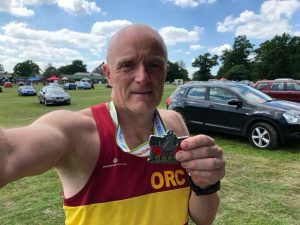 First ORC in was Graham Bryant with a fantastic new PB of 18:20. Next in was George Haskell in 18.31, also a PB, Andy Vernon was next to finish in 18:55, placing him third in his age category. First ORC lady home was Jo Bradford in 22.46 setting a new PB, winning her age category and achieving a gold award time. Next ORC home was Mags Jarvis, whose best time since 2014 of 24.50, saw her placed second in her age category and achieve a Platinum award time. Mags suffers from Parkinson’s Disease and the charity Parkinson’s UK have found that when marketing a fund-raising event it is helpful to use case studies to make people aware of the charity’s exercise programme before asking people to sign up to the event. Parkinson’s UK have asked Mags to provide such a case study about herself and exercise which they can use in this way in the future. Sarah Marvin, who has been setting some great times recently, had two good weekend runs at different parkruns. Two weeks ago she set a new FV45 club record for 5k by running 21.59 at Fulham Palace parkrun. This weekend, whilst visiting her parents in Wales, she knocked a chunk off that time and set a great new record of 21.11. Thank you Jane for the run report. Last Saturday saw the second in Okehampton Running Club’s Summer Race Series, the Marilyn’s Meldon Madness, take place. Named after former member Marilyn Cooper who sadly passed away two years ago, this is a 5 mile fell race, starting from Meldon Reservoir dam and taking runners up to Yes Tor and then on to the highest point in the south of England, High Willhayes, before a steep and difficult decent over tussock grass to Black Tor. From here it is all downhill on a path back down to the reservoir. Despite the short distance, this is still a tough race with 1,175ft of ascent and difficult terrain to negotiate, even though the continued dry hot weather had eliminated all the bogs. With an afternoon start, the sun was at its hottest and by the time the runners had completed the first pull up Longstone Hill they were already feeling the effect of the heat and the lack of any breeze. First home for the club was Rob Hicks, taking second place behind Axe Valley’s Tim Lenton, a great supporter of the club’s races. First lady for the club and overall first lady was once again Katie Littlejohns, retaining the Dartington Crystal bowl trophy, kindly donated by Marilyn’s husband Paul and her sons, that she won last year. 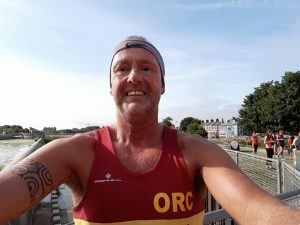 ORC Times; Rob Hicks; 39.56, Indigo Ramsey; 47.18, Katie Littlejohns; 52.05, Graham Bryant; 54.32, Phil Read; 59.51, Abby Williams; 59.55, Karen Vallance; 59.55, Hannah Ramsey; 1.05.33, Phil Turner; 1.06.13, Angus Farrelly; 1.06.28, Christine Fritsch; 1.07.54, Ruth Bushell; 1.19.33, Janet White; 1.20.56, Danielle Fullford-Brown; 1.23.41. Marilyn’s son, Micheal, also ran again this year, finishing in 54.32, an improvement of nearly three minutes on his time last year. This is the only one of the club’s races where members provide the refreshments and the teas and cakes were a great success, even when the generator stopped working meaning a campervan was drafted in to boil the water! The club would like to thank Waitrose for donating all the drinking cups for the event and the members for providing the much appreciated cakes. They also would like to thank North Dartmoor Search and Rescue who always attend this race in case of an emergency. The hot conditions continued for those racing the following day and among them was Robert Richards who ran the Gloucester City Marathon. Here, due to a road safety issue, the race organisers had been forced to replace the usual course with a gravel track event in the nearby beautiful Forest of Dean. Normally a single loop course held on entirely closed and predominantly flat roads, the replacement one consisted of four laps of a forest trail on gravel tracks which did however give some shelter from the hot sun, but with over 2,500ft of elevation it was considerably hillier. Robert took this all in his stride however and completed the marathon in 5:10. Two other Okehampton runners took part in 10k races on Sunday, with Andy Vernon running the Totnes 10k. Hosted by the Teignbridge Trotters, this race is nearly all off road and mostly flat, following the beautiful River Dart on tarmac, grass, and trail. Andy has run this race before, but struggled in the heat, completing in 45.11. 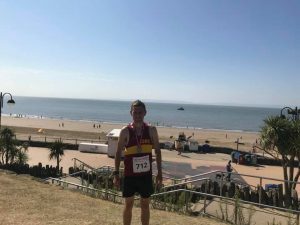 Hayden Bond went further afield to take part in the inaugural Barry Island 10k in South Wales where a course on fully closed roads, took in all of the town’s most scenic seaside spots and recognisable landmarks. Again the scorching temperatures were not appreciated by the runners, but Hayden ran a good time, completing in 42.07. And finally out from retirement (Or was it injury?) Mark Hawkins managed to complete his first race in 15 months by completing the Exeter 5k Park Run in an impressive time of 20:14. Thanks again to Jane Jackson for your wonderful reporting and to Robert Richards for the posting on to the website. Error: Error validating access token: Session has expired on Saturday, 20-Apr-19 03:20:42 PDT. The current time is Monday, 22-Apr-19 10:56:03 PDT.